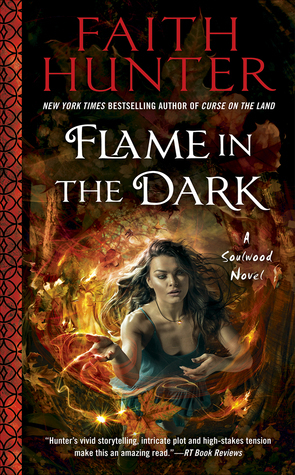 Set in the same world as Faith Hunter’s New York Times bestselling Jane Yellowrock novels, the third, thrilling Soulwood novel stars Nell Ingram, who draws her powers from deep within the earth. I'm very happy that Faith Hunter decided to expand her Jane Yellowrock world to include Nell Ingram in it. She's a smart heroine who thinks before acting. Her strength comes from the land. Her power comes from Soulwood. Nell is able to communicate with the land and if necessary defend herself using it. In this latest installment, Nell has finished spook school and now she's the new probie with Unit 18 for the PsyLED. She's getting used to her job and learning the natural interactions outside the Cloud Glory Church sect. The rest of the team is composed of Rick LaFleur, T. Laine, Occam, Jojo and Tandy. At the beginning of the novel, Unit 18 gets assigned a new case. It has a paranormal component to it and Nell will be very useful in helping determine what is attacking several important families. The case is full of suspense. As always, Nell's intelligence and power of deduction are a great asset to the team. The baddies in this one gave me the creeps. Nasty things! Flame in the Dark is full of character development. Not only for Nell but for the rest of the team too. Of course, the one which was the most impressive was Nell's. She's learning about her true power and how to use it. She's also helping her younger sister "Mud" understand she's not human either. Nell has learned from her past mistakes and she wants to protect Mud from her family and her own power. Nell will also have to deal with other thorns in her way. There's the issue of the vampire tree who seems to be getting more powerful but also more demanding, and of what to do with evil Brother Ephraim, who seems ready to attack her. In regards to the romance, slowly but surely Occam is becoming Nell's leading man. He's a very patient man who's smart enough to give Nell time to adjust to a life outside the "church". Yet, he made his intentions towards her clear as day. Don't hesitate to grab Flame in the Dark. Faith Hunter knows how to write great Urban Fantasy!